Arteries and veins transport blood in two distinct circuits: the systemic circuit and the pulmonary circuit. Systemic arteries provide blood rich in oxygen to the body’s tissues. The blood returned to the heart through systemic veins has less oxygen, since much of the oxygen carried by the arteries has been delivered to the cells. In contrast, in the pulmonary circuit, arteries carry blood low in oxygen exclusively to the lungs for gas exchange. Pulmonary veins then return freshly oxygenated blood from the lungs to the heart to be pumped back out into systemic circulation. Although arteries and veins differ structurally and functionally, they share certain features. Figure 1. The pulmonary circuit moves blood from the right side of the heart to the lungs and back to the heart. The systemic circuit moves blood from the left side of the heart to the head and body and returns it to the right side of the heart to repeat the cycle. 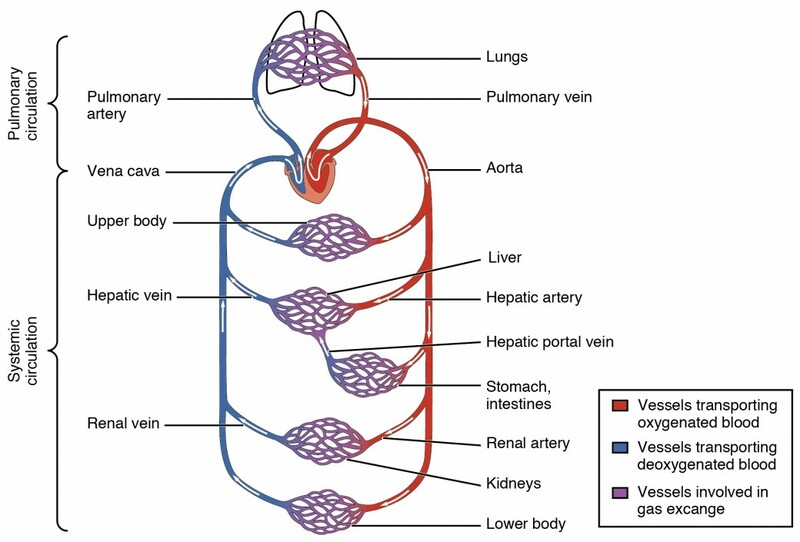 The arrows indicate the direction of blood flow, and the colors show the relative levels of oxygen concentration. Different types of blood vessels vary slightly in their structures, but they share the same general features. Arteries and arterioles have thicker walls than veins and venules because they are closer to the heart and receive blood that is surging at a far greater pressure (Figure 2). Each type of vessel has a lumen—a hollow passageway through which blood flows. Arteries have smaller lumens than veins, a characteristic that helps to maintain the pressure of blood moving through the system. Together, their thicker walls and smaller diameters give arterial lumens a more rounded appearance in cross section than the lumens of veins. The walls of arteries and veins are largely composed of living cells and their products (including collagenous and elastic fibers); the cells require nourishment and produce waste. Since blood passes through the larger vessels relatively quickly, there is limited opportunity for blood in the lumen of the vessel to provide nourishment to or remove waste from the vessel’s cells. Further, the walls of the larger vessels are too thick for nutrients to diffuse through to all of the cells. Larger arteries and veins contain small blood vessels within their walls known as the vasa vasorum—literally “vessels of the vessel”—to provide them with this critical exchange. Since the pressure within arteries is relatively high, the vasa vasorum must function in the outer layers of the vessel or the pressure exerted by the blood passing through the vessel would collapse it, preventing any exchange from occurring. The lower pressure within veins allows the vasa vasorum to be located closer to the lumen. The restriction of the vasa vasorum to the outer layers of arteries is thought to be one reason that arterial diseases are more common than venous diseases, since its location makes it more difficult to nourish the cells of the arteries and remove waste products. There are also minute nerves within the walls of both types of vessels that control the contraction and dilation of smooth muscle. These minute nerves are known as the nervi vasorum. Both arteries and veins have the same three distinct tissue layers, called tunics (from the Latin term tunica), for the garments first worn by ancient Romans; the term tunic is also used for some modern garments. From the most interior layer to the outer, these tunics are the tunica intima, the tunica media, and the tunica externa. Table 1 compares and contrasts the tunics of the arteries and veins. The tunica media is the substantial middle layer of the vessel wall (see Figure 2). It is generally the thickest layer in arteries, and it is much thicker in arteries than it is in veins. The tunica media consists of layers of smooth muscle supported by connective tissue that is primarily made up of elastic fibers, most of which are arranged in circular sheets. Toward the outer portion of the tunic, there are also layers of longitudinal muscle. Contraction and relaxation of the circular muscles decrease and increase the diameter of the vessel lumen, respectively. Specifically in arteries, vasoconstriction decreases blood flow as the smooth muscle in the walls of the tunica media contracts, making the lumen narrower and increasing blood pressure. Similarly, vasodilation increases blood flow as the smooth muscle relaxes, allowing the lumen to widen and blood pressure to drop. Both vasoconstriction and vasodilation are regulated in part by small vascular nerves, known as nervi vasorum, or “nerves of the vessel,” that run within the walls of blood vessels. These are generally all sympathetic fibers, although some trigger vasodilation and others induce vasoconstriction, depending upon the nature of the neurotransmitter and receptors located on the target cell. Parasympathetic stimulation does trigger vasodilation as well as erection during sexual arousal in the external genitalia of both sexes. Nervous control over vessels tends to be more generalized than the specific targeting of individual blood vessels. Local controls, discussed later, account for this phenomenon. (Seek additional content for more information on these dynamic aspects of the autonomic nervous system.) Hormones and local chemicals also control blood vessels. Together, these neural and chemical mechanisms reduce or increase blood flow in response to changing body conditions, from exercise to hydration. Regulation of both blood flow and blood pressure is discussed in detail later in this chapter. An artery is a blood vessel that conducts blood away from the heart. All arteries have relatively thick walls that can withstand the high pressure of blood ejected from the heart. However, those close to the heart have the thickest walls, containing a high percentage of elastic fibers in all three of their tunics. This type of artery is known as an elastic artery (see Figure 3). Vessels larger than 10 mm in diameter are typically elastic. Their abundant elastic fibers allow them to expand, as blood pumped from the ventricles passes through them, and then to recoil after the surge has passed. If artery walls were rigid and unable to expand and recoil, their resistance to blood flow would greatly increase and blood pressure would rise to even higher levels, which would in turn require the heart to pump harder to increase the volume of blood expelled by each pump (the stroke volume) and maintain adequate pressure and flow. Artery walls would have to become even thicker in response to this increased pressure. The elastic recoil of the vascular wall helps to maintain the pressure gradient that drives the blood through the arterial system. An elastic artery is also known as a conducting artery, because the large diameter of the lumen enables it to accept a large volume of blood from the heart and conduct it to smaller branches. Figure 3. Comparison of the walls of an elastic artery, a muscular artery, and an arteriole is shown. In terms of scale, the diameter of an arteriole is measured in micrometers compared to millimeters for elastic and muscular arteries. An arteriole is a very small artery that leads to a capillary. Arterioles have the same three tunics as the larger vessels, but the thickness of each is greatly diminished. The critical endothelial lining of the tunica intima is intact. The tunica media is restricted to one or two smooth muscle cell layers in thickness. The tunica externa remains but is very thin (see Figure 3). For capillaries to function, their walls must be leaky, allowing substances to pass through. There are three major types of capillaries, which differ according to their degree of “leakiness:” continuous, fenestrated, and sinusoid capillaries. Figure 4. The three major types of capillaries: continuous, fenestrated, and sinusoid. The precapillary sphincters, circular smooth muscle cells that surround the capillary at its origin with the metarteriole, tightly regulate the flow of blood from a metarteriole to the capillaries it supplies. Their function is critical: If all of the capillary beds in the body were to open simultaneously, they would collectively hold every drop of blood in the body and there would be none in the arteries, arterioles, venules, veins, or the heart itself. Normally, the precapillary sphincters are closed. When the surrounding tissues need oxygen and have excess waste products, the precapillary sphincters open, allowing blood to flow through and exchange to occur before closing once more (see Figure 5). 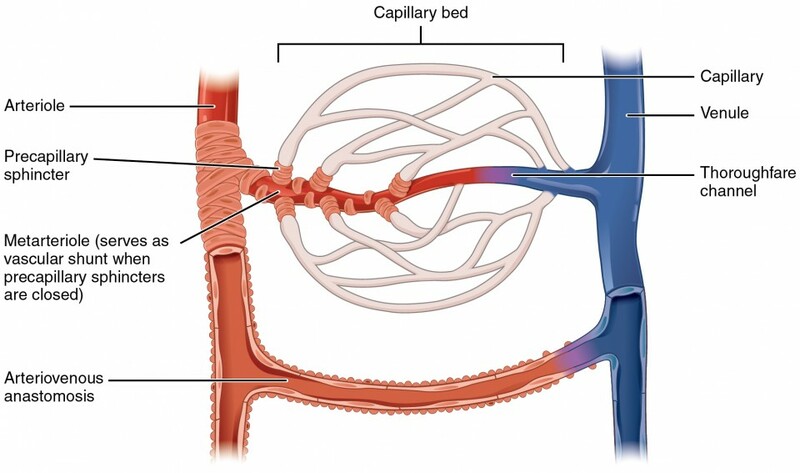 If all of the precapillary sphincters in a capillary bed are closed, blood will flow from the metarteriole directly into a thoroughfare channel and then into the venous circulation, bypassing the capillary bed entirely. This creates what is known as a vascular shunt. In addition, an arteriovenous anastomosis may bypass the capillary bed and lead directly to the venous system. Figure 5. In a capillary bed, arterioles give rise to metarterioles. Precapillary sphincters located at the junction of a metarteriole with a capillary regulate blood flow. A thoroughfare channel connects the metarteriole to a venule. An arteriovenous anastomosis, which directly connects the arteriole with the venule, is shown at the bottom. A venule is an extremely small vein, generally 8–100 micrometers in diameter. Postcapillary venules join multiple capillaries exiting from a capillary bed. Multiple venules join to form veins. 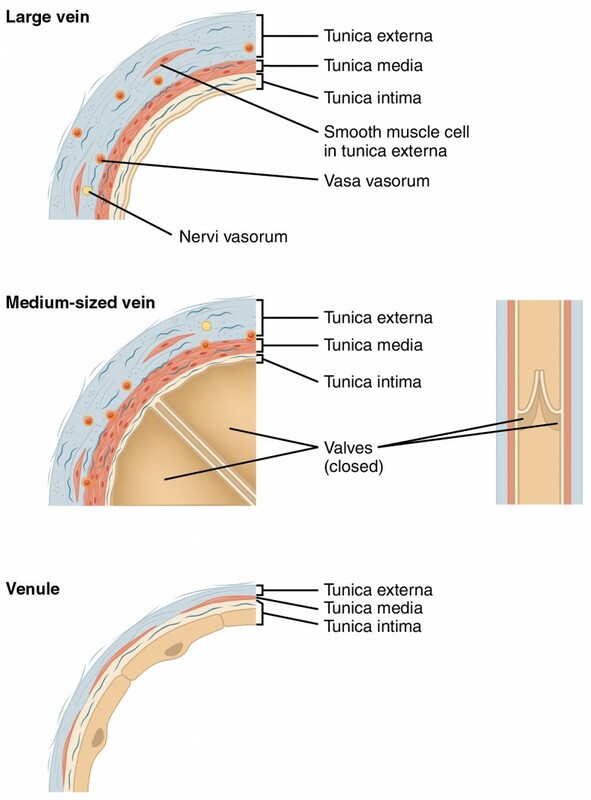 The walls of venules consist of endothelium, a thin middle layer with a few muscle cells and elastic fibers, plus an outer layer of connective tissue fibers that constitute a very thin tunica externa. Venules as well as capillaries are the primary sites of emigration or diapedesis, in which the white blood cells adhere to the endothelial lining of the vessels and then squeeze through adjacent cells to enter the tissue fluid. A vein is a blood vessel that conducts blood toward the heart. 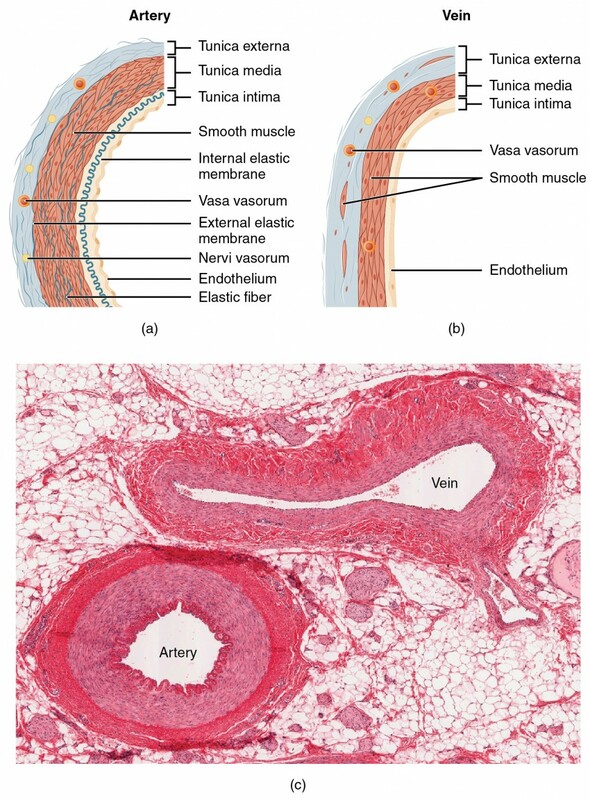 Compared to arteries, veins are thin-walled vessels with large and irregular lumens (see Figure 6). Figure 6. Many veins have valves to prevent back flow of blood, whereas venules do not. In terms of scale, the diameter of a venule is measured in micrometers compared to millimeters for veins. Because they are low-pressure vessels, larger veins are commonly equipped with valves that promote the unidirectional flow of blood toward the heart and prevent backflow toward the capillaries caused by the inherent low blood pressure in veins as well as the pull of gravity. Table 2 compares the features of arteries and veins. 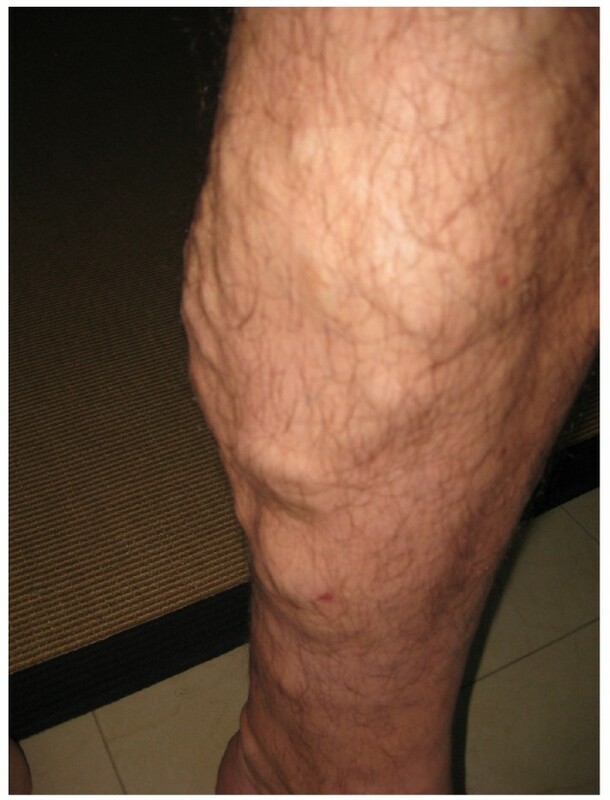 Edema may be accompanied by varicose veins, especially in the superficial veins of the legs. This disorder arises when defective valves allow blood to accumulate within the veins, causing them to distend, twist, and become visible on the surface of the integument. Varicose veins may occur in both sexes, but are more common in women and are often related to pregnancy. More than simple cosmetic blemishes, varicose veins are often painful and sometimes itchy or throbbing. Without treatment, they tend to grow worse over time. The use of support hose, as well as elevating the feet and legs whenever possible, may be helpful in alleviating this condition. Laser surgery and interventional radiologic procedures can reduce the size and severity of varicose veins. Severe cases may require conventional surgery to remove the damaged vessels. As there are typically redundant circulation patterns, that is, anastomoses, for the smaller and more superficial veins, removal does not typically impair the circulation. There is evidence that patients with varicose veins suffer a greater risk of developing a thrombus or clot. In addition to their primary function of returning blood to the heart, veins may be considered blood reservoirs, since systemic veins contain approximately 64 percent of the blood volume at any given time. Their ability to hold this much blood is due to their high capacitance, that is, their capacity to distend (expand) readily to store a high volume of blood, even at a low pressure. The large lumens and relatively thin walls of veins make them far more distensible than arteries; thus, they are said to be capacitance vessels. When blood flow needs to be redistributed to other portions of the body, the vasomotor center located in the medulla oblongata sends sympathetic stimulation to the smooth muscles in the walls of the veins, causing constriction—or in this case, venoconstriction. Less dramatic than the vasoconstriction seen in smaller arteries and arterioles, venoconstriction may be likened to a “stiffening” of the vessel wall. This increases pressure on the blood within the veins, speeding its return to the heart. As you will note in the image above, approximately 21 percent of the venous blood is located in venous networks within the liver, bone marrow, and integument. This volume of blood is referred to as venous reserve. Through venoconstriction, this “reserve” volume of blood can get back to the heart more quickly for redistribution to other parts of the circulation. Answer the question(s) below to see how well you understand the topics covered in the previous section. Arterioles are often referred to as resistance vessels. Why? Cocaine use causes vasoconstriction. Is this likely to increase or decrease blood pressure, and why? A blood vessel with a few smooth muscle fibers and connective tissue, and only a very thin tunica externa conducts blood toward the heart. What type of vessel is this? Arterioles receive blood from arteries, which are vessels with a much larger lumen. As their own lumen averages just 30 micrometers or less, arterioles are critical in slowing down—or resisting—blood flow. The arterioles can also constrict or dilate, which varies their resistance, to help distribute blood flow to the tissues.